I lasted 4 months. Omnifocus was too rich for my needs and Wunderlist not enough. I switched to Reminders as it synced between iOS and Mac and app’s like Fantastical displayed the todo’s alongside my calendar. It was working well apart from one thing – iCloud. Last weekend saw my Reminders yet again get out of sync. iPhone different to iPad and different to the Mac. So frustrating and coupled with some annoying usability issues it was time to look elsewhere again. After looking at the usual options I plumped for Todoist and one week later it’s working out well. The most attractive feature of Todoist is that they have clients on every platform. Every doesn’t just mean iOS, Android and Mac. Web, Windows, Outlook – in total there are 13 different platforms and devices from where you can manage your to-do’s. Thankfully the sync works quickly and I’ve had no issues with entering, updating and closing off to-do’s across all platforms. Unlike so many applications at work, Todoist works well on Windows so I can keep on top of things no matter where I am and what device I’m using. On all platforms Todoist provides a clean interface and a quick way of entering to-do’s. Date support is great and also understands plain english so entering a recurring task is as easy as writing ‘every 7 days starting next wed’. You can also write ‘due date after 6 months starting 15 March’ which means the to-do will recur not every 6 months from the March 15th but 6 months from when you completed the task that was scheduled on the 15th. A small detail but one I really like. 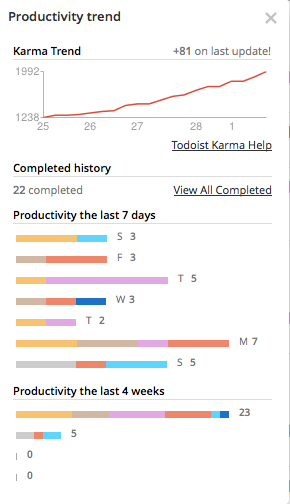 Karma is Todoist’s way of showing how productive you are being. A bit gimmicky but coupled with colours against projects it provides a nice overview of what you complete and when. Labels and filters across all platforms also allows you to implement a fairly comprehensive GTD workflow if you are that way inclined. Projects can be nested as well as tasks so you can break down a to-do into as fine a detail as you want. I particularly like the iOS interface. Easy to add/edit a to-do with quick access to labels, priorities and reminders. Making a change to the date brings up some common options too – switch to tomorrow, next week or pick another date. Very nice and Android is much the same, just not as pretty. While Todoist is free and allows you to sync across all clients there is a paid element which add’s Reminders, Notes and Labels & Filters for $29 a year. After a couple of days use I paid for the year to get the three features and it does take the flexibility of Todoist to another level. Reminders can be received via e-mail, SMS or push notifications and have worked flawlessly over the last few days. As mentioned, Labels and Filters allows you to build a sophisticated GTD workflow if you want to…or just add more relevant filtering. 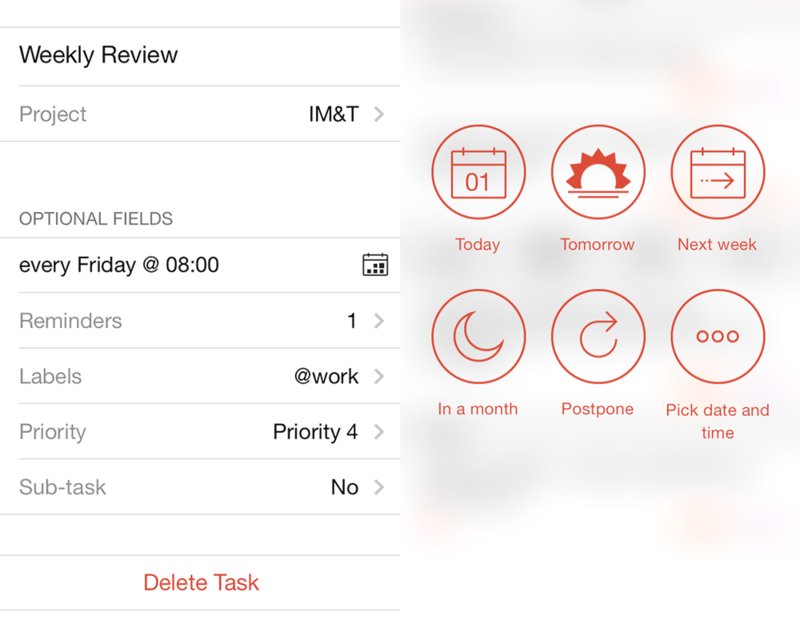 Again the filters are available across all platforms making it easy to stay on top of tasks. Multiple Notes can be stored against a to-do which is nice for tracking progress on a task and you can also attach files to the to-do. One aspect I won’t use is collaboration with others on projects and to-do’s but overall I couldn’t be happier with Todoist. I’ve finally found a to-do manager that has flexibility coupled with speed without being overly complex.